Steal a set amount of gold's worth of items. "Just steal whatever we can until we've made an impression." Steal 500 gold in goods from the target city. After joining the Thieves Guild, Delvin Mallory will tell you that he handles all the fishing, numbers, and bedlam jobs. The purpose of these small side jobs is to help the Guild rebuild and retake their influence around Skyrim. Ask him for a bedlam job and he will explain: "Sometimes we like to remind a city that we mean business, so we hit it hard. Just steal whatever we can until we've made an impression. Simple right? Almost. The catch is it doesn't count if anyone sees you take it. The message needs to be clear; we work in the shadows. Steal from anywhere in the hold, and you even get to keep everythin' you stole. So, you in?" 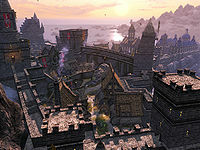 If you accept the job, Delvin will name one of the five major cities in Skyrim, although you can actually steal from anywhere in the specified hold. Raven Rock in Solstheim can also be a target for the job if Dragonborn is installed (see bugs). Your objective is to lift five hundred gold worth of general loot without being seen by anyone or caught by the guards. If you are caught by the guards, the job is forfeited. There is no penalty from the Thieves' Guild; only the inconvenience of being imprisoned, and paying an out-of-pocket fine. You may begin the job again at any time, once you speak with Delvin. Additionally, if you want to quit the job, whether to acquire a different job or a different city, you can tell Delvin at any time. He grumbles, but there is no actual penalty, no matter how many jobs you quit. Once you have accumulated the targeted amount of stolen goods from the city or hold, return to Delvin to a leveled amount of gold. You can repeat this quest as often as you like. Unlike the Sweep Job or similar collection quests, this quest will not have a visible counter telling you how far you have progressed. Picking pockets, even if successful, does not count towards this quest. Items obtained in The Sweep Job and The Burglary Job count towards the 500 gold, provided they take place in the same hold as The Bedlam Job, despite having zero value. Picking up a Stone of Barenziah from an owned house in the hold related to the job will complete the objective, despite the stones showing a value of 200 and not being marked as "stolen". You keep all the items you've stolen, and they can be fenced in addition to the gold reward. It is not necessary to get arrested to fail this quest - merely being detected while breaking the law is sufficient. This includes trespassing and lockpicking (unless you have Quick Hands). Stealing an item only works once. You cannot drop the item and pick it up again for the next Bedlam Job. It is impossible to complete this quest if you are sent to Raven Rock. You can complete the quest manually via the console using the following console command: setstage TGRNT 50 . If you do get the job in Raven Rock, the only way to clear it and to receive other jobs from Delvin is to either tell him that you want to quit, or intentionally get caught. There are no negative consequences for quitting. 10 I've been told to steal 500 gold in goods from <Alias=City> without witnesses. Items I'm seen stealing won't count towards my total, so I need to keep out of sight. I need to complete this job without getting caught and spending time in jail. 200 Finishes quest I've successfully completed this job and been allowed to keep everything I've stolen. 250 Fails quest During the course of this task, I was arrested and sent to the local jail. I've therefore failed the job. Fails quest Before the task could be completed, I decided to quit. I've therefore failed the job and forfeited any pay I might have received. On the PC, it is possible to use the console to advance through the quest by entering setstage TGRNT stage, where stage is the number of the stage you wish to complete. It is not possible to un-complete (i.e. go back) quest stages, but it is possible to clear all stages of the quest using resetquest TGRNT. This page was last modified on 24 October 2018, at 06:48.